Go with the Flo by Boon. You can easily slip Flo over your faucet to create a waterfall effect that your children will love. It is also very effective to entice little ones to rinse their hair without getting soap in their eyes. The soft, rubbery material has protective guards to help prevent bumps on the noggin’ and other bath time nozzle injuries. As safe and effective this new bath tool is, none of it beats the coolest feature of a built in bubble bath reservoir that “dispenses a sea of suds with the press of a button.” How cool is that? It was already hard enough to get my boys out of the bath. Now they want to stay in their extra long for their short people shower time. Jakobi is just tickled that I am not dumping buckets of water over his head, and Mason loves all the “instant” bubbles. 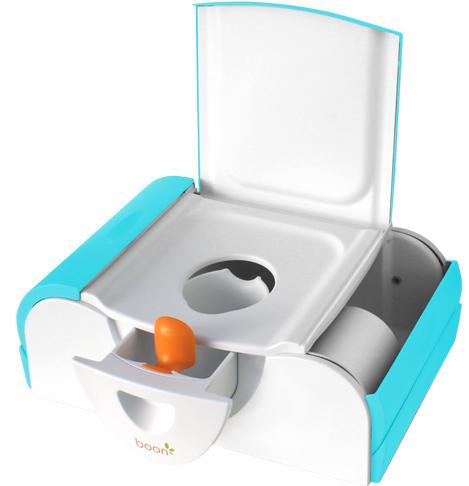 Another great product from Boon, is this Potty Bench with side storage that they have so generously provided for one of my lucky readers to win. Potty train in style! Giveaway will end on June 14, 2011 at 11:59 pm EST. Open to US only. Please make sure your email address is public on your profile or leave with your comments so I can contact you should you win. ***When entering a giveaway, you MUST complete the mandatory entry requirements FIRST before completing your optional entries. If you do not successfully complete the mandatory entry or leave a valid email address, then you will be disqualified from the contest. *** The winner will be chosen by random.org and announced here as well as emailed and will have 48 hours to respond or a new winner will be chosen. This review and giveaway is in no way associated with Facebook, Twitter, or any other entity unless otherwise specified. I received no monetary compensation for this review but was supplied this product free of charge for evaluation purposes; however, all opinions are still 100% my own.